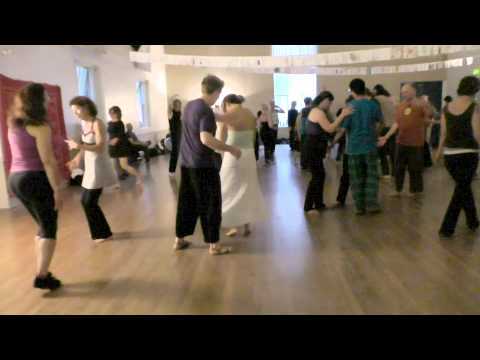 Every style of movement is welcome at Open Floor -- some participants even sit still as the dance swirls around them. Photo by Veronica Weber. By day, he was a software architect; she was an accountant. By night, they danced. Four years ago, longtime Palo Alto residents Bart De Greef and his wife, Juilien Ling, discovered a dance group that met on Monday nights at the Masonic Lodge in Mountain View. The dancing there was free-form, without steps to memorize, a beat to adhere to or techniques that had to be followed. The music varied from jazz to classical, hip-hop to trance. Nobody spoke, yet the room was full of vibrant energy. It was like a sober nightclub where everyone was friendly and welcoming, and nobody judged. Even the name, Open Floor, suggested tolerance and possibility. Bart was instantly hooked. It took Juilien a little longer to come around. "He tried to convince me to go, and I said, 'Oh, I don't dance,'" Ling recalled. "I finally joined maybe half a year later." It wasn't long before Mountain View Open Floor had become one of De Greef and Ling's favorite parts of the week: an important physical, emotional and social outlet and a community where they felt a deep sense of belonging. They came to trust the group's organizer, Claire Alexander, who had studied for years with 5Rhythms founder Gabrielle Roth before branching into the Open Floor dance tradition, and who gently guided each evening's session, making sure participants felt safe. Eventually, De Greef took on a role as volunteer coordinator for the group of about 100, befriending even more dancers in the process. Then, in April 2014, tragedy struck the community. One of the regular dancers was in the midst of a difficult divorce when she was diagnosed with breast cancer. Together, the rest of the dance community rallied around her, setting up a website to coordinate volunteers who could drive her to and from chemo appointments, help with grocery shopping and take her children to school. A few months later, another member of the group shared that she had been diagnosed with a brain tumor. This time, it was De Greef who took the lead in organizing support for her during her treatment. In October, yet another dancer suffered a devastating loss when her 11-year-old son died following major heart surgery. In early December 2014 there were storms forecast for the Bay Area. In preparation for the heavy rains, De Greef planned to clean out the gutters on his house. On the evening of Dec. 9, Ling returned home from work to find her husband crumpled against the wall in the hallway. He had fallen from the roof, and had made it inside but collapsed before he could call for help. An ambulance rushed him to the emergency room, where he was put in a medically induced coma and diagnosed with a severe brain injury. Once again, the Open Floor community sprang into action. "This time, it was really Claire who stepped in and created a website for Bart," Ling explained. "In a very few days, more than 200 people had signed up already, and not just from the dance community." While Ling spent most of her time with her husband at the hospital, friends dropped off homemade meals, sent their prayers and even hired workers to clean her swimming pool. "I was very, very touched," Ling said. "It's a lot of money and a lot of effort involved." And beyond the contributions of time and finances, Ling said, she felt less lonely knowing she had such a strong support network, particularly in her fellow Open Floor dancers. "My husband's family is in Holland and mine is in Taiwan, so we don't have relatives here," she explained. "So basically, they are like my family." How did a weekly dance class become so much more than a leisure activity -- something more like a spiritual community? According to Lisa Herendeen, it's not a coincidence. "I think that Gabrielle Roth really understood something that had been lost in secular churches," Herendeen said of the woman who popularized the precursor to Open Floor. "She understood that the holy spirit would come when you turned your mind off. Eastern philosophies understand this, and Western churches understood this once, but it kind of got lost. "I think that's why we're such a close-knit group," Herendeen continued. "We get out of our heads, and that embodied wisdom is wise about how we need each other and how we need to help each other." For Herendeen, needing help is much more than a theory. The social worker and mother of two moved to the Bay Area six years ago from New Jersey. She soon discovered Mountain View Open Floor and began to attend regularly, finding respite from a troubled marriage that seemed to be falling apart. Three years ago, she and her husband began divorce proceedings. Then in May 2014 Herendeen was diagnosed with breast cancer. Shortly thereafter, her landlord told her she'd have to leave her apartment. It was fellow Open Floor dancer Thom Franklin who stepped in first. "To me, it was not acceptable that she should be alone," he explained simply. Franklin, a project manager for various Silicon Valley tech companies, spearheaded the relief effort for Herendeen, letting other dancers know what she needed. Week after week, people showed up to provide help. Meanwhile, Herendeen continued to attend Monday night dance classes, even when chemo made her too weak to dance or even stand up. She went, she explained, because "just having Monday night was an anchor, knowing there would be friends and happy faces there to greet me." As a social worker, Herendeen said, she's particularly attuned to social ills. "I think one of the big problems is isolation," she said, adding that she has found California more isolating than the East Coast, in part because of the geographical distances and our reliance on the car for transportation. "Claire's group provides what people really need," she said. "I think that's why it's so popular. People need community." For Franklin, the sense of community at Open Floor is inseparable from the freeing physicality of the dancing. "If you go to a disco or a club, sometimes there's one person there who's dancing really differently," he said. "That's who these people are. When you're really in touch with what your body wants to do, it doesn't look like what you did in high school." Getting in touch with the desires of the body is actually a very simple process, Franklin said, it's just that it requires a little space. "We can tell when our bodies are hungry or need to go to the bathroom," he said. "Some people can even tell when they need a hug. Your body has a series of messages for you." But learning to listen to those messages -- or knowing how to interpret them -- isn't always easy, he acknowledged. "If, like me, people are attached to their devices and their computers screens all day, we get more and more detached from those messages." Franklin has worked in the tech industry for two decades, and has been attending Open Floor for more than half that time. "I've missed maybe two dozen Mondays in the past 14 years," he said, adding that there are a number of other longtime attendees in the group, as well as newcomers showing up almost every week. "We come to dance for different reasons: for joy, for safety, for security, for forgiveness, for letting something go that you've been carrying," he said. "There are as many reasons to come to dance as there are people, I think." As the founder of Mountain View Open Floor, Alexander agrees. When she moved to California in 1999, Alexander was working in admin for a Silicon Valley tech firm and missing her life as a dance educator. "One of the things I noticed in the Silicon Valley was how many people were depending on their intellect and were at a loss as to how to live in their bodies," she remembered. Eventually, she started leading a weekly dance session just to see who might show up. She played a wide range of music, mostly letting participants dance without interruption, sometimes introducing a theme like grounding, making contact or focusing on flow. After a year, she had a group of about 12 students. A few years later, it was up to 20 each week. Then came the dot-com collapse, and Alexander found herself without a job. "I looked at it and thought, 'If I could just get 25-30 people through the door each week, I have enough savings to make this work,' so I gave myself a year to see if I could grow the business," she explained. That was in 2003. These days, there are about 50 dancers on the floor most weeks. "It surprises me every year," Alexander said. "I haven't worked for a corporation in 12 years." Yet rising rents are making life in the Silicon Valley increasingly challenging both for Alexander and for many members of the Mountain View Open Floor group. At the same time, participants and organizer alike feel they've created a powerful community that helps meet their fundamental human needs, and they're not eager to let it go. Though similar groups exist around the nation and the world, those who have attended other Open Floor and 5Rhythms groups report there's something especially warm and tender about the Mountain View community. "I like to think of us as a tribe," Alexander said. "Everybody is always included, unless they are really a danger to someone else in the room or cannot respect authority. It doesn't matter who you are or what your affiliations or beliefs are: You're a part of us if you want to be there." The long-term future of the group may be uncertain, but for now, the Open Floor community feels like a tight-knit family whose members have supported one another other through difficult times. Herendeen is preparing for one last surgery next month, and De Greef has made significant progress: After months of rehab, he's regained the ability to walk and to speak; Alexander called his ongoing recovery a "stunning turnaround." And every Monday, dancers gather at the Masonic Lodge to greet each other with hugs, step out of their busy and sometimes difficult lives for a couple of hours and simply dance. Info: Go to ecstaticproductions.com or email info@ecstaticproductions.com. Being a part of this dance group is one of greatest joys in my life! The freedom, expression, connection, community, healing - and just straight fun - is awesome. What a great salve for the ills of an excessively technical world. In addition, my body intelligence has increased through this practice. I'm grateful for this community that makes me feel so alive! If you have not tried it, do yourself a favor and go for it. There's no choreography to learn, no way you have to be or look. It's a safe place to be yourself and connect with spirit, self, others. This is my tribe. I been dancing with this tribe for fifteen years. I considerate it counseling for the body. I leave class feeling freer and much more alive and glad to be me. I do not have to know what is going on with me, it all comes out naturally as I let my body move as it is inclined to move. And energy naturally moves through me to refresh my existence. I am fascinated with all the life glitches I have encountered and work through within this tribe. I endured a break up, celebrated a reunion, danced for years with a partner within the class, and survived the loss of one. I went from being fiercely athletic and fit to finding new ways to dance after breaking my tail bone snow boarding... then in enduring treatment for a debilitating neurological disease - and then later crushing a finger and coping with extreme nerve pain from CRPS for a few years. Now with Degenerative disc disease from chronic inflammation, I do what I can to move in ways that free my spirit. I just dance and do what I can, and rest when I need to, or dance sitting or laying down. I have had happy times when I bounced around the room like a gazelle and completely broken down sad times I curled into a fetal position on a sheepskin rug for most of the evening, And a few times a year when my movement is sincerely aligned with the urges of my soul; when my motion speaks the truth of my being, ecstatic sensations swirl in a spiral up my spine – sensations so lovely it is hard not to try to chase, capture, or hold or recreate the sensations. I always leave class feeling more free and whole than I ever thought possible! And over the many years, I can tell I am more free to be me out in the world as well. It is a cheap ticket to paradise that includes a charming unavoidable dose of personal growth and self awareness. I highly recommend it. In this valley of intellectual, brain oriented jobs, this is a perfect practice to rebalance the being and include and highly revere the body's wisdom. I've been dancing off and on with this community for the last three years. They are always welcoming and respectful, the music is infectious and catchy, and I always take something new home with me at the end of the evening. Sometimes it's an idea that the movement shook loose, sometimes it's a part of my body that needed some loving movement that I wasn't aware of... Sometimes it's a wonderful hug, or a challenge to some ossified way of thinking that forces me to re examine what I think I know. This class will challenge your assumptions about dance classes. You should try it, especially if you've ever been envious of "people who dance" Seriously: if you can walk, you can dance, and even if you can't walk, you can dance. It's Been a wonderful experience for me. Elizabeth Schwyzer is a registered user. Steve, Erin, Liz and Steve: Thank you for sharing your personal testimonials. They add a great deal to the story. Please encourage anyone else who can shed light on this group and the experience of Open Floor to add their comments here on Town Square as well. I love this article, the community, the inspiration, the support that tribal dance offers both on and off the dance floor. and it also makes me very sad to read the skewed and incorrect factual history in this. I danced in this community for years and it was a very wonderful 5Rhythms class from the start. not Open floor. it is only until very more recently that it has been renamed and the practice has shifted. That is also a beautiful thing..growth & change is always wonderful and I embrace it. as a piece of news....the writing of this article without some obvious fact checking historically is inaccurately giving the credit of the foundation, growth of this community, and holding of this container for many many years to something that isn't historically truthful and I question why Open floor is receiving the full credit. Open floor is its future but for a lot of the timeline in this article it is not accurate as 5Rhythms is what grew and has held this space and community for years. I love 5Rhythms, and as I discover Open Floor I'm curious. I've danced here in the past and will continue to be a part of it as I drop in from time to time in the future. But please, where is the accountability for editorial integrity here? Thank you for your feedback, Laura. You're absolutely right that Claire Alexander was originally trained in 5Rhythms and lead her classes in that tradition before branching into the Open Floor practice. I chose quite intentionally not to focus on the history of the relationship between the two practices or on Alexander's decision to align herself more closely with Open Floor, but instead to focus on the nature of the Open Floor group today and the unusual way its members have supported each other through the crises of the past year. However, it is stated in the article that Alexander "had studied for years with 5Rhythms founder Gabrielle Roth before branching into the Open Floor dance tradition." If you'd like to share more about the history of the group in the 5Rhythms era, this is a great place to do so!